When you buy a home, you pay for things you don’t have to pay for as a renter: loan interest, property taxes, insurance, and even maintenance and repair costs. That’s part of the argument in favor of renting: there are so many additional costs and factors that get overlooked. That goes for both sides, though, and the details vary depending on the situation. Here are a few commonly overlooked factors that make up the specifics. • How long you’ll live in the home: This varies depending on the market, but in general, the longer you’re in the home, the better, because your costs are spread out over time. • The cost of housing in your area: In most cases, people rent because houses are just too expensive, but it all depends on the market in your area. 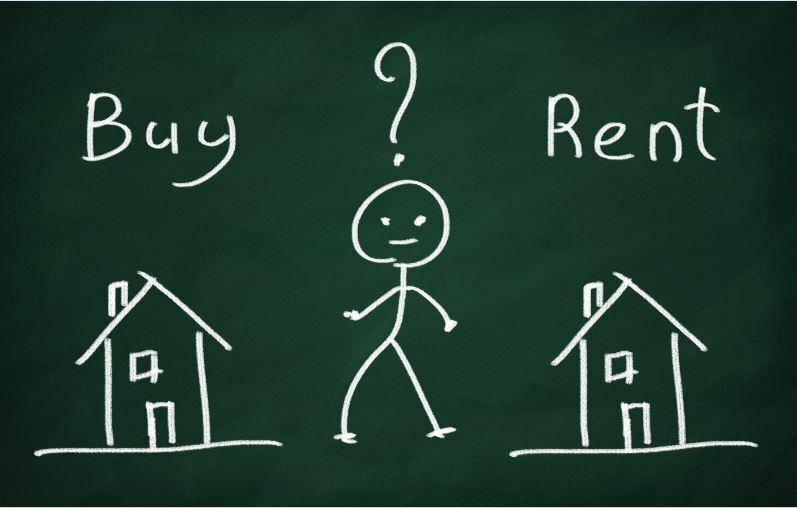 If renting is extremely costly in your area, it might be more affordable to buy a home. • The opportunity cost of your taxes and insurance: What kind of long-term return could you get if you invested this money instead, in the stock market, a CD, or even a “high interest” savings account? • The opportunity cost of your down payment: Similarly, how much of a return could you get if you invested that lump sum instead? It’s impossible to say renting or buying is a better decision because each one of these factors (and more) depends on your unique situation. You have to consider where you live, what kind of house you’re looking for, how much you pay in rent, how much you’ll pay in the future…the list goes on and on. A Rent vs. Buy calculator is a great tool for simplifying these complexities, depending on your own individual specifics. Still, a calculator can only do so much. It might tell you the better long-term decision on paper, but that still doesn’t mean it’s the best decision for you. Most experts agree that you shouldn’t think of your primary home as an investment. Contrary to popular belief, real estate barely outpaces inflation over time. Sure, you could time the market, flip a house, or buy a rental, but that’s different from expecting your primary home to earn you a sweet return. The investing myth is another valid argument against buying. Many people buy homes they can’t afford or stretch their finances to pay for expensive home projects because they buy into this myth. The bottom line is: sometimes it’s smarter to rent, and sometimes buying can work in your favor. Rather than giving in to one side or another, it’s more helpful to learn the rules, crunch the numbers, then do what works—and feels right—for you.